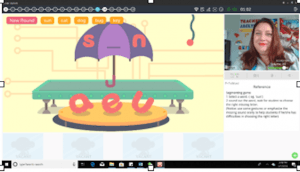 You are here: Home / TESOL Review: How to Make Money Teaching English Online with Qkids! About the author: Jaclyn Roche is a Full-time Mom, Writer, and teaches English Part-time online Teacher with QKids. As a former brick and mortar teacher, I really enjoy waking up each morning and working from home. I don’t have to commute. I can wear whatever I want to work and I am ready to go. Because of QKids’ unique platform, I don’t need to plan any lessons or evaluate the students. I simply need to show up and be my quirky, energetic self. The best part is , the children are eager to meet and learn from you! I provide the energy and the know-how. The students show up with the enthusiasm and thirst for knowledge. In addition, QKids brings learning to another level by making it fun and engaging for both students and teachers. Their software application is simple to learn, and the classrooms are configured for up to four students. The small class setting is ideal for getting to know your students and building a rapport with them. I have had some of the silliest and most interesting interactions with my students! I look forward to every class; these are amazing kids. As the teacher, your job is to guide the students through slides and games designed to deepen and enrich their understanding of the English language. There is the opportunity to teach phonics, pre-language acquisition, and a variety of levels, including those where the students have built fluency and comprehension of the language. The software works as your prop and you are its’ director, determining how to enrich the lessons and engage the students. Unlike other companies, you start teaching with full classes from day one. There is no need to worry about building a following since the awesome staff at QKids schedules for you. Every Sunday the calendar for the upcoming week is finalized and you can view the classes you are teaching. Be Prepared To Teach Online and Apply today in our 120-hour TESOL course! Attendance bonus – If you attend all your classes, that is easily an extra $150. This part is so simple and gets you a chunk of money. Review bonus – if you get this bonus on all 38 classes that is another $150. QKids has made getting review bonuses even easier than before. You are required to get a 4-star rating per class instead of a 4.75 rating per week. Again, give 100% effort. Be fair. Take turns. Award diamonds as earned. Make sure every student has the same number of speaking tries or turns in a game. Use TPR (total physical response), gestures, props, and LISTEN. You’ll learn, with time and experience, when and where to extend or increase your pace based on what the students need and their ability. With all the above you are now making a bit over $1,300 a month. That’s great! Find out in our next blog what further steps you can take to make $1,300 + per month teaching English online with Qkids.